East Meadow, NY - September 8, 2015 - Nassau County Executive Edward P. Mangano announces that The National September 11 Memorial & Museum will tomorrow distribute three saplings - grown from the only tree to survive the World Trade Center (WTC) attacks of September 11, 2001 - to Eisenhower Park, The Nassau County Fire Academy and Rath Park in Franklin Square. The saplings journey began as the charred trunk of a Callery pear tree was pulled from the smoldering rubble of the WTC site after the 2001 attacks. The tree earned the name “Survivor Tree” and has grown to become a living reminder of resilience, survival and rebirth. Each year, the National September 11 Memorial & Museum gives seedlings from the Survivor Tree to three communities that have endured tragedy in recent years. 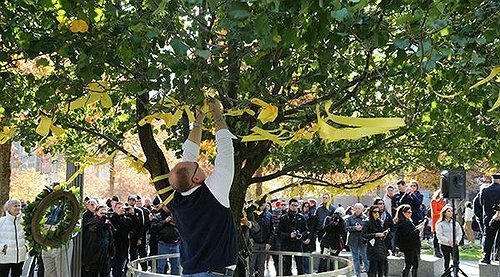 The Survivor Tree seedling program was launched on September 11, 2013 in partnership with Stamford, Conn.-based Bartlett Tree Expert Company and John Bowne High School in the Flushing neighborhood of Queens. During its’ rehabilitation, seeds were collected from the original tree and seedlings were generated. On September 9th several of these precious descendants will be escorted to Long Island by FDNY Firefighter Matthew Yellico, retired from Ladder 107, and his wife Francesca, from the Long Island Volunteer Center. Fireman Matthew Yellico is a September 11th first responder and worked at Ground Zero for many months. On Thursday, September 10th at 6:30 p.m. in Eisenhower Park, Nassau County will welcome The Survivor Tree Sapling at the Annual 9/11 Sunset Candlelight & Remembrance Ceremony. In recognition of this donation, residents are asked to consider donating blood on behalf of the Long Island Volunteer Center at their annual blood drive on September 21st from 2 p.m. to 8 p.m.at the Nassau County Firefighters Museum in Garden City. This blood drive is an Annual Day of Service Project in remembrance of September 11th. Subject: LongIsland.com - Your Name sent you Article details of "Mangano: Nassau To Receive Three Saplings From Ground Zero's Survivor Tree"